Veesible at latitudes atween +45° an −90°. Best veesible at 21:00 (9 p.m.) durin the month o September. 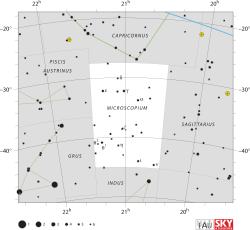 Microscopium /ˌmaɪkrəˈskɒpiəm/ is a minor constellation in the Soothren Celestial Hemisphere. This page wis last eeditit on 20 August 2015, at 16:39.